If you look for crochet inspiration on the magazine stands right now, you’ll be spoilt for choice, there are some fabulous autumn issues on sale. The latest “new kid on the block” is #Crochet, and I’m pleased to say it features two of my favourites designs alongside a brand new collection I designed especially for this first issue. 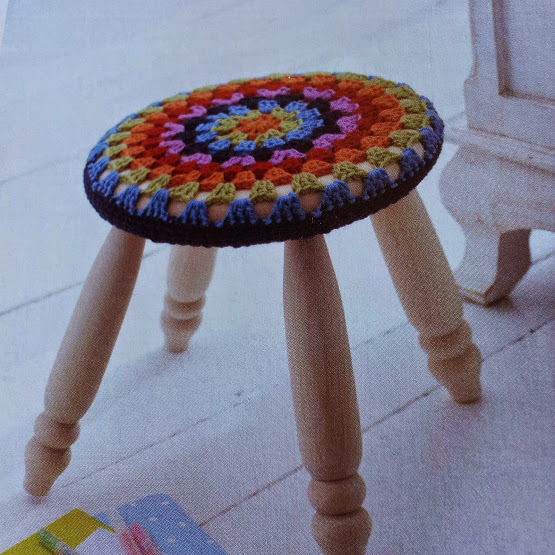 Up first is this gorgeous stool cover, which I designed for the Dorling Kindersley Book “Crochet”. I have always loved the colour combination I chose for this project and I’ve used it several times since. Every time I see it pop up in print it makes me smile and cheers up a dull day! 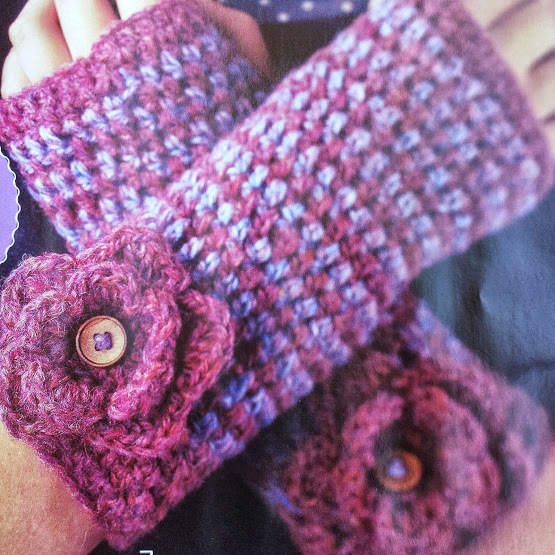 I was also very chuffed indeed to see the New Lanark Wrist Warmers I originally designed for Love Crochet make an appearance, made in one of my favourite British wools, they are simple, quick and make ideal gifts. Finally, the editors asked for a collection suitable as a desk set. Designed in rainbow brights, the tiny garland is just the right size to hang across a filing cabinet or computer screen. 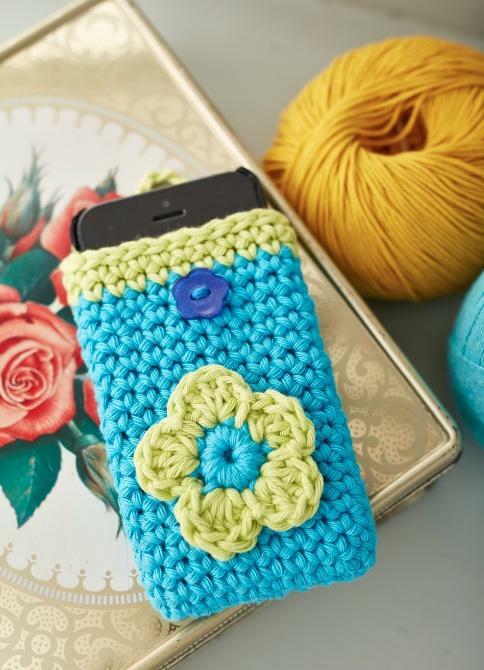 The pencil case and pot holder continue the rainbow theme and you’ll even spot an ipad cover and phone cosy – ideal as a beginner project. I may be slightly older than the demographic this magazine is aimed at, but I have to admit I loved it. 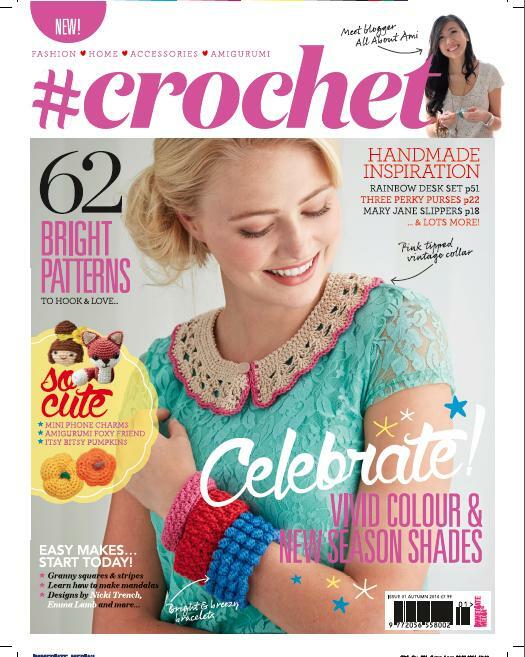 There is a crochet collar by Emma Escott (pictured on the cover), which is beautifully styled and really shows off her design to best advantage. I also love Sarah London’s Turkish Delight blanket. There is a great mix of projects and interviews in this first issue, so do look out for it. Priced at £7.99 it would be a great gift for someone who has recently taken up the hook, or even as a special treat for yourself. The next issue should be on sale before Christmas and I’ve hooked up something rather pretty for that one – no clues now – you’ll just have to wait and see!